Before you can understand why a cavity is contagious, you must understand what causes a cavity. 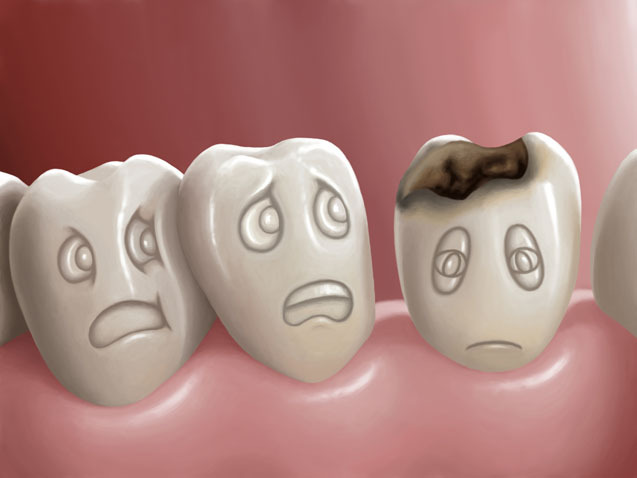 Cavities are caused from bacteria. The bacteria comes from foods that you consume throughout the day. If you do not brush your teeth properly, the bacteria feeds on your teeth and will eventually form plaque. As the bacteria continues to feed, your tooth is stripped of its enamel and a cavity forms. How Can Cavities Be Shared? Since cavities are caused by bacteria, if you share the bacteria with someone, then the other person can form cavities as well. Simple things you do not think about such as sharing toothbrushes can transfer bacteria from mouth to mouth. Also, sharing utensils, straws, and other similar items can cause bacteria to transfer from one mouth to the next. One of the best ways to prevent cavities is to keep your mouth clean and brush your teeth regularly. You want to avoid sharing utensils, toothbrushes, and others items from mouth to mouth to prevent the spread of bacteria. It is important to make sure you are visiting your dentist on a regular basis to have the additional plaque removed from your teeth. Dental caries can quickly spread from one person to the next when you share items and do not keep your mouth clean. Protect yourself, protect your children, and protect others by brushing, flossing, and not sharing items.